No more than the size of the tip of my pinkie, this little daffodil caught the eye of my observant daughter when we were out for a walk the other night. We had to stop and admire it's determination to grow, as well as its ability to be so perfect and cute. The picture does not do it justice. 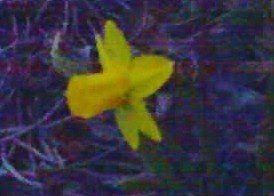 However it was dusk when we discovered the tiny beauty, and I took the picture with my camera phone because the picture had to be taken then and there. Who knew what could happen to it overnight if we didn't capture it at that moment. Honestly, how could we let one of the first sweet flowers of spring be passed by!